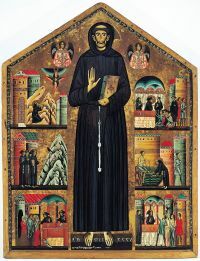 Berlinghieri’s St. Francis of Assisi (1235). She shot back a look, somewhat surprised, almost shocked at my question. It seemed she found it incredulous that anyone would ask for HER account of her experience. And why not? Having been diagnosed multiple times by different people in different institutions, she was not unfamiliar with psychologists who took judicious notes during their sessions with her. ADHD, Depression, Asperger’s syndrome, Executive Functioning Disorder: she has heard it all. She felt her every move was being watched for further signs or proof of her latest diagnosis-to-be. Elizabeth was no stranger to therapists and institutions. My heart reached out to her as she recounted the pain of her stay in a mental health hospital—the confusion of diagnoses that seemed to change every few years, and the side effects of medications she did not want to take. “Just who am I?” I could almost hear her ask, as she grappled with the different labels she had, uncertain about their truths. “Is my seeming inability to read the emotions of others because of Autism? Or could an unexpressive father, coming from a cruelly competitive society when men are taught not to express any form of emotion, be part of my difficulty?” she asked. Objective, scientific truths espoused by those wielding diagnoses are the realities of her experiences. Between these two protagonists of her life, what kind of a relationship did they share? How did they interact with each other? And how did she interact with each of them? Does truth really set us free, as Jesus said? And if it does, what kind of truth would it be? These were questions for which I had no answers, but part of me felt a conviction that the journey into searching for these answers would be deeply healing. For about half a year now, I have been a part of a Graduate Diploma in Counselling Practice course in Singapore. While the course is theoretically oriented towards systemic ideas, humanistic principles undergird a large part. There is an expansive focus on the validity of subjective human experience. The natural outflow of this stance is the active involvement of our trainers in helping us to cultivate a sense of curiosity as we work with our clients. Up until now, curiosity as I understood it was a cognitive exercise. “What might you be curious about?” is a question our trainers commonly ask in class. I often find myself searching for intelligent interpretations, clever theories, and circular assumptions to answer that question. There are dozens, if not hundreds, of issues, relationships, and ideas we can be curious about. Based on our theories and assumptions, we can make some fair guesses about which issues might be more pertinent than others. Yet, there is a world of difference between a intellectual curiosity and a healing curiosity. To know what exactly to be curious about—in order to bring forth the client’s self-healing—requires wisdom, humility, and insights gleaned from our own healing journeys. As I progress and grow as a therapist, I find myself wanting to develop a healing curiosity. A curiosity that acknowledges the client’s inner experience as valid, real, and true. A curiosity that puts aside the shield of my expert knowledge and puts on the shoes of my human-ness. A curiosity that assumes that I do not know, making space for my client to share with me and make meaning from the many facets and depths of their experience. At times, this is an arduous journey. It takes all of me to hold back on my assumptions and truly connect with my client, but I want to believe this is a worthwhile journey. This curiosity seeks to console and not be consoled, to understand and not to be understood, to love and not to be loved. This curiosity holds hope for healing, because in so doing I communicate to my client his worth and value. This curiosity can be an instrument of peace within and without. There is nothing else as precious in all of humanity.